how do I automate my reporting solution? automation module for aaa-reports! (AM) introduces the ability to collect/import logs and generate reports at scheduled times so that you can install and configure it once - then forget about it. AM adds a new configuration tab inside aaa-reports! that allows the user to create any number of report batches. Each batch may comprise multiple canned & custom reports (each with its own parameter set) and its own publishing scheme (such as intranet web/file server or email recipient list). 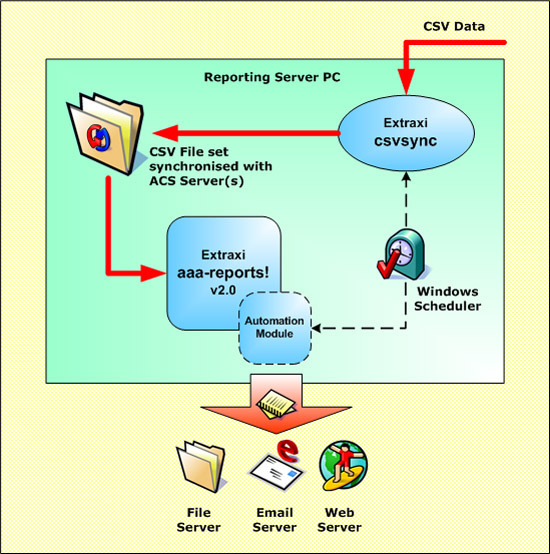 The reports are either emailed to the relevant recipients or published on your intranet web/file server, or both. With the AM installed aaa-reports! now exposes several new command line switches (for import & report generation) that allow for customised scripts to be written. The Windows built-in Scheduled Tasks wizard makes it straight forward to execute the script at the required times. The script can be written in your preferred language (command shell, VB Script, or other) . The automation module is automatically installed alongside aaa-reports! v2 but licensed separately.